Have you ever noticed that some people are very prone to mosquito bites – while others will only attract a few nibbles? It’s not just your imagination. Mosquitoes really do bite some people more than others. They use their acute sense of smell to locate new victims over long distances, and some human scents stand out to them more than others. The larger you are, the more likely you are to attract mosquitoes. Children and women get bitten less frequently than men. Mosquitoes are attracted to the carbon dioxide we give off when we exhale, and larger people emit the most of the gas. Mosquitoes locate hosts by detecting chemicals we release through our sweat, including uric acid, ammonia and lactic acid. When you work out, lactic acid builds up in your muscles. A higher body temperature also attracts mosquitoes. So, if you’re out for a jog, there’s a good chance that you’re advertising yourself to nearby mosquitoes. Your genetic makeup also influences how attractive you are to mosquitoes. Some people naturally give off more of these chemicals when they sweat than others. People who have an O blood type (negative or positive) are twice as likely to get bitten as those with the A blood type, while people with a B blood type fall somewhere in the middle. While having a O blood type is desirable in blood donations, it also means you’re a mosquito’s preferred snack. The same study found that 85% of people are “secretors” – they release a chemical signal through their skin that indicates their blood type. Secretors of any blood type are more likely to get bitten than the remaining 15% of the population. Pregnant women are more likely to get bitten by mosquitoes because of their increased body temperature and increased exhalation of carbon dioxide. Being pregnant also means that if you are affected by the Zika virus, your baby could be born with a neurological disorder like microcephaly. Pregnant women should never take chances with mosquitoes. A 2002 study showed that people are significantly more likely to be targeted by mosquitoes after enjoying an alcoholic beverage. This means it makes sense to move the party indoors. Even so, there’s really nothing like a cold beer combined with the crisp night air. While people are less likely to make responsible decisions while inebriated, it doesn’t take much planning or coordination to apply bug spray to exposed skin. Worrying about mosquitoes isn’t just for pregnant women, people who exercise, or people with an O blood type. If you’re the nearest host, a mosquito will happily accept you as their next meal, so long as you have blood to give them. Mosquito-borne illnesses like yellow fever and the Zika virus can affect anyone. If you’re going outside, take just a few seconds to prepare by spraying exposed areas of your skin with your preferred bug spray. A lush, green lawn is something to be proud of – and many pests will agree. The water you use to keep your lawn hydrated can attract pests, keeping them healthy and hydrated until they hitch a ride on you, your kids and pets, or sneak their way into your home. Many of these pests are perfectly content to stay in the grass, creating unsightly patches as they feast on your lawn. There’s no shortage of poisons to put these pests to bed. However, these solutions can be toxic to your lawn, your family and your pets. They can pollute waterways as they wash away in the rain. These chemicals are expensive. And they’re totally unnecessary. Everyone has that one lawn pest that they hate the most. Who’s your mortal enemy – is it a family of moles, tunneling for grubs and making a mess of your soil? 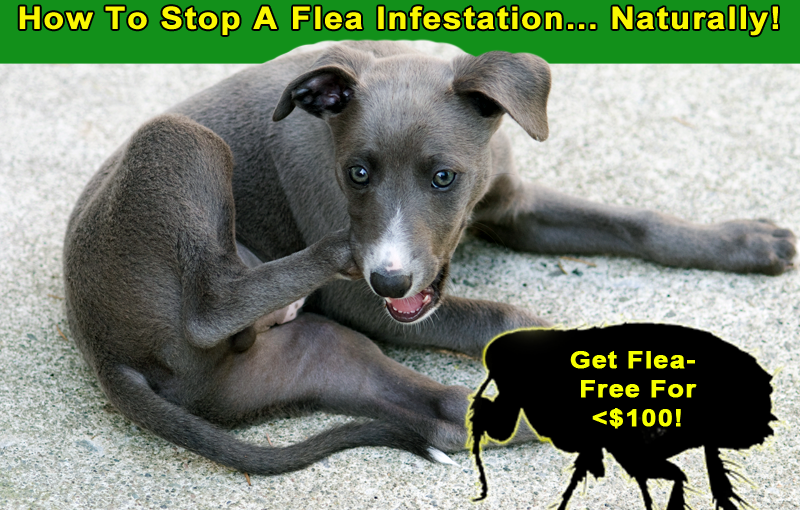 Or is it generations of fleas, relentlessly attacking your pets and making them miserable? Chances are, you’re fighting an all-out war, battling each day to get your lawn back from multiple populations of lawn pests. All of these pests destroy the hard work you’ve put into your lawn. They make it impossible for your kids and pets to romp worry-free. They ruin the beauty of your grass, and bring disease instead. Step 1: Kill The Sprinklers. In the dry heat of the summer, you might be tempted to overwater your lawn to compensate. Sometimes, you might forget to turn the sprinklers off, or you might rely on an automated timer to control your sprinkler system, leaving your grass soaked to the roots. If you’re noticing an excessive amount of mosquitoes, mold, mildew, or worm casings, there’s a good chance that cutting back on the water can help reduce the problem. Know your type of grass and water accordingly. If your lawn squishes under your feet, even hours after watering, or the water is running off into your driveway, unable to soak into the grass roots, cut back. You’ll see fewer pests and a reduced water bill. Step 2: Spread Red Cedar Granules. 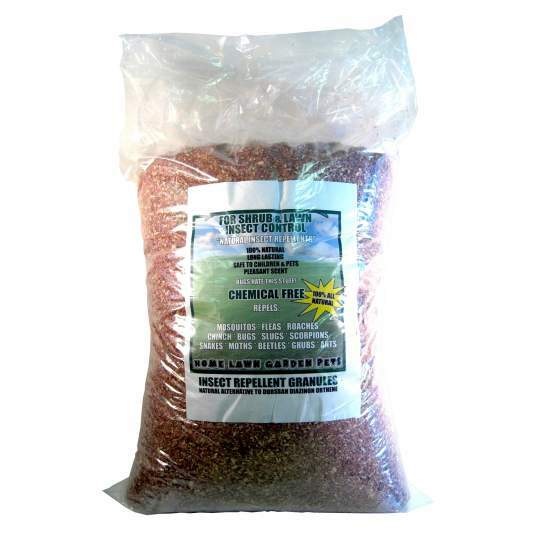 Spread red cedar granules to control insects, grubs, snakes and rodents. Make your lawn a less friendly place for pests to live by spreading red cedar granules across your lawn. A hand-held seeder can help you evenly distribute the granules. Surround your home with a border of granules to discourage disgruntled pests from entering your home. Place granules directly in ant hills and mole mounds. The granules repel pests on your lawn, in kennels, dog runs, gardens and shrubs for at least 3 months. Cedar products also eliminate odors, replacing offensive odors with a pleasant, woodsy aroma. Step 3: Spray Nature’s Defender Cedar Oil. Use Nature’s Defender to refresh cedar granules and neutralize mold and mildew and reduce insects. 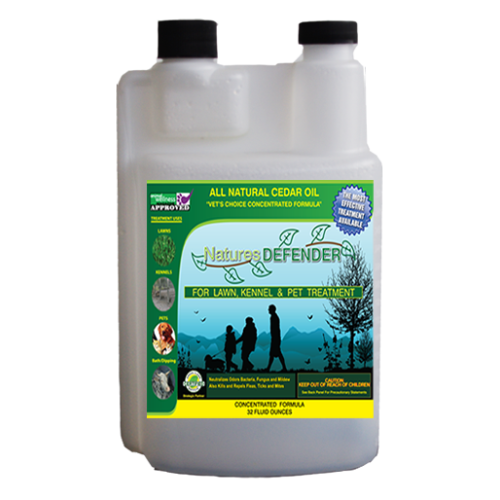 Treat your lawn with a natural cedar oil product like Nature’s Defender. You can use the hose-end sprayer to quickly spray your entire lawn, creating a pest-free environment. Used in conjunction with cedar granules, you’ll build a powerful defense against pests. The antimicrobial properties of cedar neutralizes mold and mildew, while insects like fleas, mites and mosquitoes are disrupted at all stages of their life cycles. After the initial application, you can dampen your lawn every 15 days to keep your lawn pest-free. When the cedar granules lose their potency, they are refreshed when you spray again. The granules help keep the cedar oil in place, continuously keeping pests from infesting your lawn. Step 4: Have A Well-Deserved Picnic. Now that you’ve got your lawn back, it’s time to celebrate. 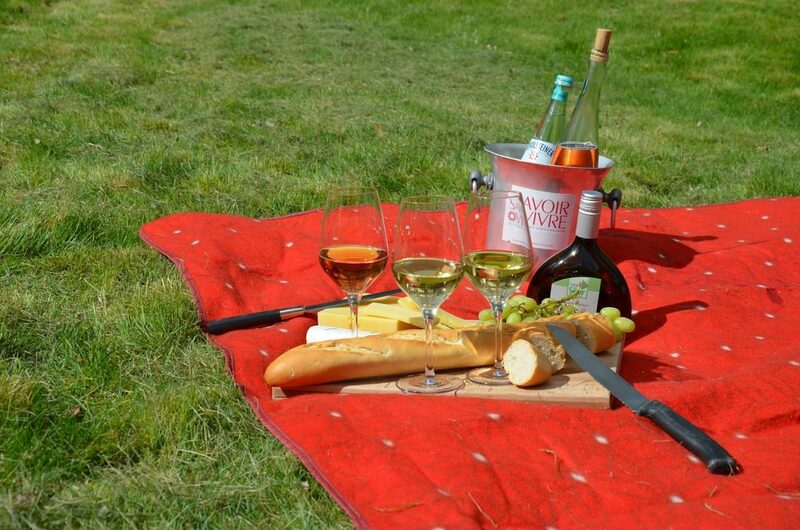 Grab your picnic blanket, wine, cheese and sandwiches and raise a toast to your lush, green lawn. No longer do you have to worry about getting bitten by mosquitoes, stung by fire ants, and bothered by grubs. Enjoy! One of the biggest health scares of 2016 is the Zika virus. Previously found in other countries, cases are beginning to pop up across the United States. 1. Zika Virus Is Transmitted By Mosquitoes. The most common way people are infected by the virus is by being bitten by a mosquito that has previously bitten an infected person. Mosquito bites are annoying, and usually harmless. However, you should never go outdoors without protection with the confidence that you can stand a few nibbles. There are many mosquito-borne illnesses, including malaria, West Nile Virus, and Yellow fever. Why risk it? Wearing long-sleeved shirts and long pants, even in hot weather, can shield your skin from mosquito bites. You’ll also want to use a repellent. Cedar oil spray can be applied directly to the skin, clothing and pets. Make sure to get all exposed areas of your skin, including your face, neck, and behind your ears. If you’ll be using sunblock, apply it before using the insect spray. 2. Most People With Zika Virus… Don’t Know It. With the hype surrounding the virus, you might be surprised to learn that many people who contract it do not actually show symptoms. Those that do may experience a fever, rash, red eyes and joint pain for just a few days. There’s currently no vaccination or treatment for Zika – doctors typically tell their patients to manage symptoms with over-the-counter aspirin. Since so few people affected actually see a doctor, it’s not uncommon for the virus to go unnoticed. That’s not necessarily a good thing. If people do not realize they have it, they will not take steps to prevent others from being affected. A small percentage aren’t so lucky. 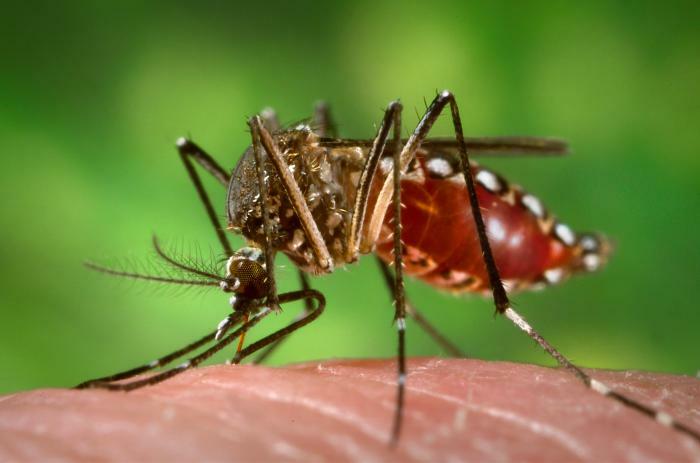 Zika virus can result in serious complications, such as acute disseminated encephalomyelitis (ADEM) – which causes inflammation of the brain and spinal cord, and Guillain-Barré syndrome, an autoimmune condition that attacks nerve cells. These patients suffer short and long term symptoms including numbness, loss of vision and cognitive difficulties. 3. Travelling Puts You At Risk. While hundreds of Zika cases have been reported in the continental United States, most of them involve travel to affected countries. In Florida, however, some patients were infected despite not having traveled – instead having been infected by a local mosquito. 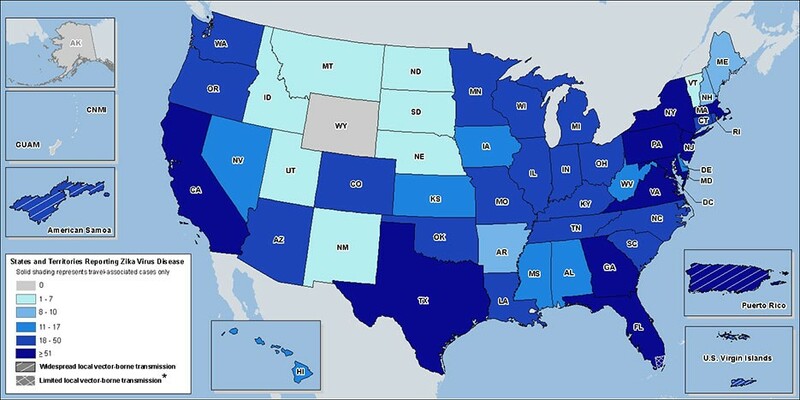 Zika virus cases are found in most of the United States, but a majority of states’ cases are travel-related, with the exception of cases in Florida. 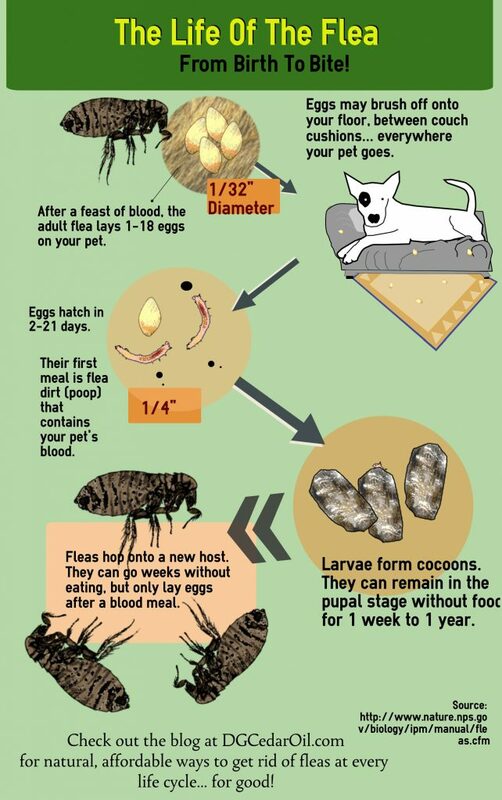 Courtesy of CDC.gov. Be very careful when travelling to affected countries. The virus is widespread in many countries in North, Central and South America, as well as some parts of Africa and South East Asia. 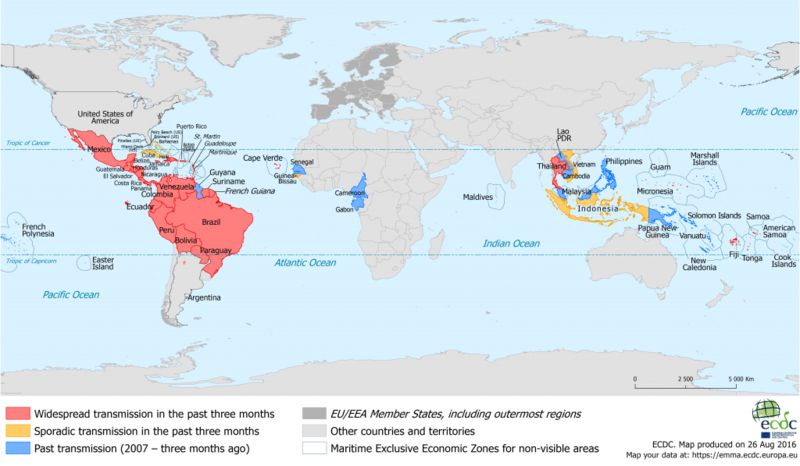 Map of countries affected by the Zika virus, courtesy of ecdc.europa.eu. 4. Pregnant Women Should Be Extra Careful. A Brazilian baby with microcephaly, a condition that causes the child to have a small head due to irregular brain development. Women who are pregnant or may become pregnant need to be extremely careful. The Zika virus is known to cause miscarriages, stillbirths, microcephaly and other fatal birth defects if transmitted from mother to baby. 5. Not All Mosquitoes Carry It. Fortunately, only certain types of mosquitoes can carry the virus, Aedes aegypti. This type of mosquito exists in most of the United States, though the Southern states are considered a “high risk zone,” with higher concentrations of the species. 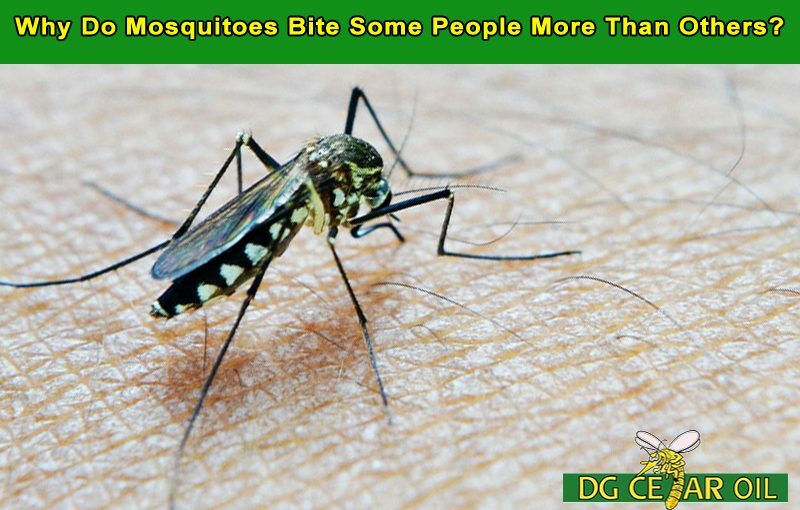 Even so, other types of mosquitoes can carry other diseases. Your best bet is to avoid getting bitten, regardless of where you live. Avoid standing pools of water, cover up exposed skin, and use bug spray to treat your family, your pets and your home and garden. Stay safe! Cedar oil is not only a safe and effective means of ridding your home or office of pesky insects, but it is an excellent solution for the removal of rodents as well. The pharmaceutical drug Anipryl (or generic selegiline) works to alter specific brain neurotransmitters. A standard treatment for Parkinson’s disease in people, it’s also been found to improve symptoms for some dogs with cognitive dysfunction syndrome (CDS). It’s estimated that 75% of treated dogs will show improvement in at least one clinical symptom within two months of therapy. Sounds impressive – but what this really means is that not all dogs will respond and results vary widely. This drugstore option is my Plan B. So let’s move on to Plan A. Mass Honeybee Deaths: Getting Worse, Not Better. Fido and the fourth of July jitters… Tips from Paula Tarifaj, DVM to keep your dog calm during the festivities. Fireworks Season – help dogs cope and keep them safely indoors! Posted on July 1, 2013 December 10, 2013 Author Wayne GreshamCategories UncategorizedLeave a comment on Fido and the fourth of July jitters… Tips from Paula Tarifaj, DVM to keep your dog calm during the festivities.